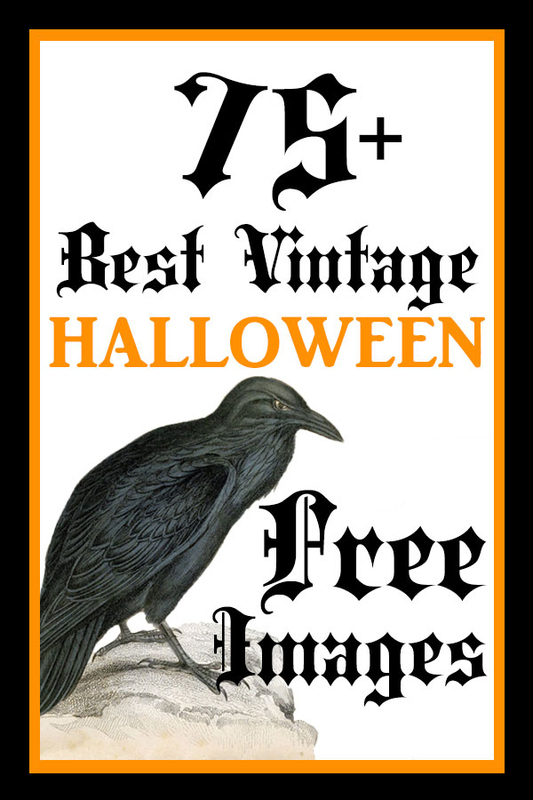 75+ Best Free Vintage Halloween Images! 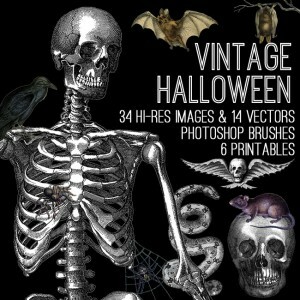 (We’ve updated this post with even more Free Halloween Images!) Halloween is coming up, so now is the perfect time to create those Halloween projects! I thought it might be helpful to list some of my favorite & most popular Vintage Happy Halloween Images and Halloween Clip Art, grouped in one post, so that you can get going on your Halloween Crafts and Decorating! There is something for everyone in this list, from charming old postcards, to creatures that will make you squirm. This list includes images for everything from vintage pumpkins, creepy crawly bugs, serious owls and ravens, frightening bats and rats, witches, to morbid advertising. You’ll be sure to find something that you can use to Craft up the perfect Halloween Holiday! Each listing below has a link in it, just click on it to get to the post and grab the graphic! 1) Short Eared Owl. This owl has just landed on an old branch with his dinner. 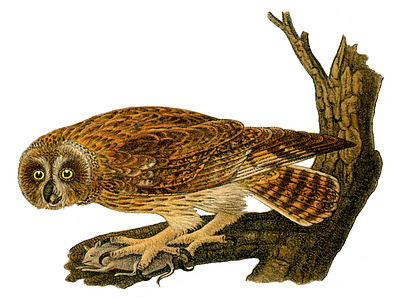 I just love the brown and gold tones in this image and the owl’s yellow eyes in this realistic drawing. 2) Owl Silhouette. This was an old post from back in 2007! This very spooky owl silhouette in black and white. An owl sits on a branch in the moonlight with just his piercing eyes visible. 3) Owl Family. Taken from an out of print children’s book, this is a very pretty black and white realistic drawing of four owls. This could possibly be a mother and her ready-to-leave-the-nest babies. 4) Owl Border. This lovely drawing of four owls in black & white can be used as a border, digital stamp, or graphic element on invitations and craft projects. 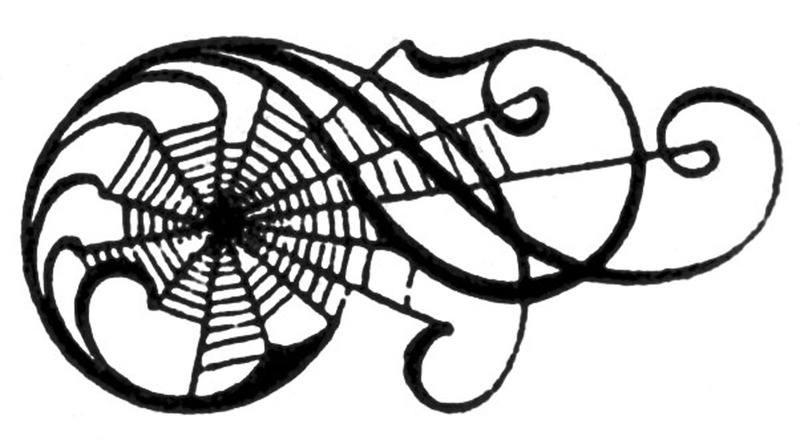 5) Dangling Halloween Clip Art Spider & Spiderweb. 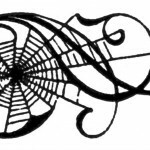 This post has not one, but two great spider images! 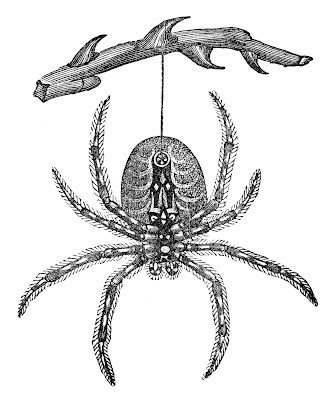 One is of a spider in the process of making a full spider web and the second is of a very detailed spider dangling from a thorny branch (above). The full spider even has hair on his legs! 6) Death’s Head Hawk Moth. This moth’s name says it all. A creepy black and white Halloween Clip Art etching of a moth with an unusual pattern and what looks like a skull on its back. 7) Orange and Black Bugs. Three vintage images of black and orange beetles are perfect for Halloween projects. I just love the unusual body shapes and patterns on these guys! 8) Hairy Tarantula. This post has three wonderful Halloween images in black and white and also sepia tones. These were originally from an old dictionary and include a hairy tarantula, a hanging bat (it looks like a fruit bat? ), and a hissing copperhead snake. 9) Moth Book Plate. This beautiful antique moth book plate features seven moths lined up in a row with beautiful calligraphy. The moths are in coordinating beige, grey and cream tones. This full size printable would be perfect for some instant Halloween art, and the moths are perfect for decoupage projects! 10) Serious Raven. 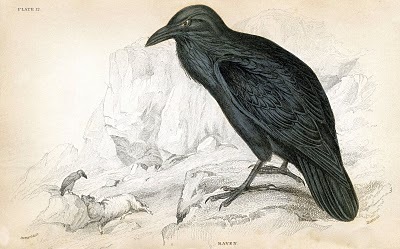 This antique natural history print of a raven looks very serious and angry. Another raven in the background is ready to eat a sheep, but from the look of our angry raven, his friend wasn’t sharing. This is a classic looking hunched over raven pose that can be used so many ways. 11) Stretching Blackbird. This is the least serious or threatening image we have in this category! Taken from a children’s encyclopedia, this blackbird is standing on a branch, stretching with his neck to the sky. 12) Vintage Crow. This highly detailed, hand colored 1859 natural history print is of a standing crow tucking one leg under himself. 13) Raven Eating a Worm. This raven is leaning over eating a tasty snack. If you have image editing software, this raven could easily be combined with other graphics like bones, and transformed to be eating an even more disgusting snack. 14) Serious Woman. 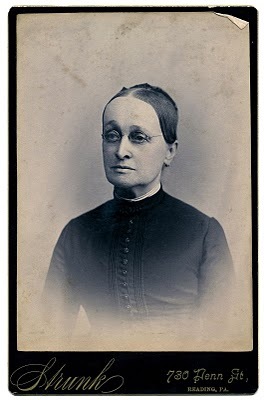 This old cabinet card from my collection features an older woman with glasses. Her black buttoned up dress and hair have a very severe look, making her perfect for Halloween crafts. 15) Children in Costumes. A black and white photo of a large group of children on a porch with their Halloween costumes on. It looks like Little Bo Peep and cowboys were popular costumes around this time! 16) Witchy Woman. This woman is either very serious or very sour. Either way, she makes a great witchy woman for Halloween! You can pair this photo with a witch hat or other clip art to dress her up for the holiday. 17) Cranky Boy. This little boy with glasses is all dressed up and ready for his professional photo shoot, but looks like he’d really rather be outside playing. He’s giving the camera an “are you done yet?” look. 18) Googly Eyed Pumpkin Girl. I just love this old postcard illustrated by Ellen Clapsaddle. This wide-eyed child is decked out in her Halloween costume, sitting with a large happy pumpkin on her lap. This is the perfect Happy Halloween Image! 19) Pumpkin with Vine. I originally posted this image back in 2007. This realistic pumpkin was originally a children’s game piece. A bright orange, well formed pumpkin sits on the vine. 20) Plump Pumpkin. This plump pumpkin scrap looks to be from the 1950’s and is a view looking down (just like you came across it in the pumpkin patch). 21) Two Color Pumpkin. This post includes two images of the same pumpkin is lying on its side, surrounded by vines and leaves. I’ve included a black and white version and an orange and white version. These two retro style images remind me a lot of linoleum block prints. These would be great for Thanksgiving projects as well! 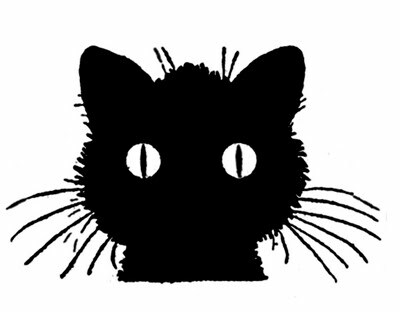 22) Cat Head Halloween Clip Art Silhouette. This image is from an old drawing book and features the head of a cat. Only his long whiskers and white eyes can be seen against the all black silhouette. 23) Black Cat with Moon. This one is from an old type book and has the silhouette of a black cat with big white eyes on a ledge with an arched back. An orange moon is behind the cat. I really like the unique looking border around this one. 24) Smiling Cat Silhouette. This one is a vintage silhouette of a smiling cat with a big orange bow and glowing orange eyes. 25) Owl and Cat by the Moon. This old Halloween postcard features several symbols of Halloween, an owl and black cat next to a witch’s hat and broom by the moon. The yellow moon is really set off by the bluish grey postcard background. 26) Young Witch with Black Cat. This vintage postcard by Ellen Clapsaddle shows a happy young costumed witch with a white dress, red cape and red hat, holding her black cat, with a pumpkin tucked under her arms. 27) Happy Halloween Witch on a Pumpkin. This lovely witch came from an old postcard. She is sitting on an oversized pumpkin and squeezing her black cat. She is smiling and dressed in an all red dress, cape, and shoes. Her black pointy hat is adorned with a flowing red ribbon. 28) Pretty Witch with Cat. This vintage newspaper image of a young witch holding a broom with her meowing black cat at her feet. She wears a pointy hat and her hair is long and flowing. A very pretty image! 29) Retro Witch Riding a Broom. This 1940’s witch is from and old printer’s book. The black and white image shows a smiling young witch with a pointy hat riding a broom in the moonlight. 30) Batty Costumed Ladies. These ladies are not witches, but victorian ladies dressed in bat costumes! Both ladies are wearing capes, large ears on their heads, and unique skirts. These are really unique images for Halloween. 31) Witch Girl Postcard. This full color image is of a young witch girl holding her black cat and broom. She is wearing a red dress with a green cape, and her pointed black hat is adorned with red ribbons. 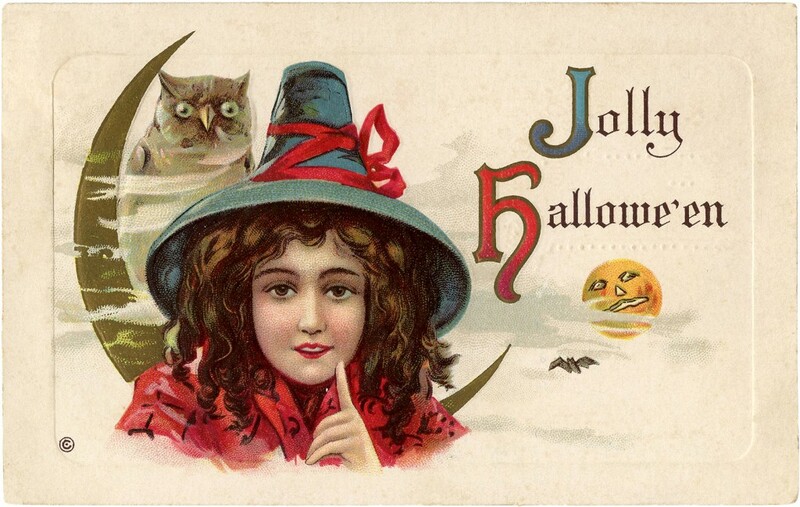 This image came from an antique Halloween postcard, but you can download the original postcard, just the girl, or just her hat for your projects. 32) Victorian Houses. 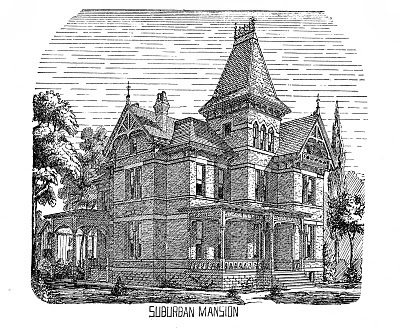 These old black and white architectural drawings of Victorian homes, remind me of foreboding haunted houses. These Victorian mansions could easily be modified and combined with other images to make them super spooky. 33) Ornate Iron Gate. This black and white image came from an old hardware catalog and could easily be incorporated in to some spooky scenes. The ornate iron gate could be adorned with some crow silhouettes or some spooky clouds and a moon. 34) Barren Tree. This black line drawing of an old pear tree has lost all of its leaves. I love the crooked lines of the many branches. This one is perfect for your spooky scenes and designs that require a spooky barren tree. 35) Grouchy Moon Man. This quarter moon image is bright yellow and was taken from an old Halloween postcard. This moon man is not happy – his eyes, nose and mouth all seem to indicate that he’s upset with something. A great one for your Halloween projects! 36) Happy Moon Man. This image has been one of your favorites since it was posted a few years ago. This full moon has a face that is peering off to the side. He is a light yellow with a friendly face, and was originally from a trade card. 37) Realistic Rats. 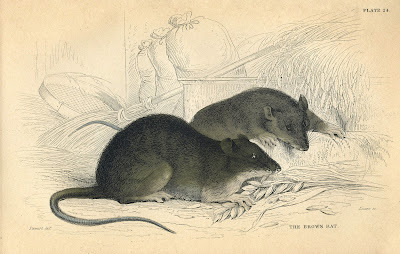 This realistic antique hand colored image is of two rats that look like they’ve gotten in to a farmer’s grain. This full sized printable can be used as a great piece of instant art. 38) Front View Bat. This black and white image is of a bat if viewed lying on it’s back. His wings are semi-extended and you can also see the detailed webbing between his back legs. 39) Flying Bat. This realistic dark brown and black bat looks like he is swooping at night to catch bugs. This post has both the original natural history image, complete with moon and castle ruins in the background, as well as an edited image of just the bat gliding through the air. 40) Hanging Bat. This antique dictionary image is of what looks to be a hanging fruit bat. He has large eyes and is hanging on tightly to a branch with semi-closed wings. 41) Red & White Poison Labels. This post has two old red and white rectangular poison labels, one in English and one in Spanish. Both feature a skull and crossbones, warning everyone to steer clear of the bottles these were on. 42) Aresenic Poison Label. This vintage pharmacy label is for arsenic. The old poison label includes a skull and crossbones and details of the original druggist as well as an antidote for poisoning. 43) Undertaker Ads. I found three different undertaker and burial graphics in two different books. All three feature a horse and carriage pulling a wagon with coffins. Two of the ads include the name and address of the undertaker. 44) Owl Advertisement. This vintage advertising scrap features a closeup of an owl head staring directly forward. This brown owl has a bright blue neckband with an ad for Colburn’s mustard. 45) Skull Side View Halloween Clip Art. This one is of a skull from the side. I’ve included both the original scan on a sepia background, and a black and white version. This skull has no medical labels on it, and is a great classic side view image of a skull. 46) Skull and Leg Bones. This great post has two full size black and white anatomical printables, one of a frontal view of a skull and the other of legs bones with a few different views. The size and detail of these images makes them perfect for larger scale projects that require images of bones. 47) Skeletal Hand. A wonderful full sized, detailed black an white scan of a skeletal hand. The bony appendages have been labeled with their medical names. 48) Human Brain. This black and white etching is from an 1870’s encyclopedia. There are two graphics in this post, the human brain is shown from a top view and from the side and both are labeled with their medical names. I love these black and white images for instant art or for making creepy labels. 49) Spectacles with Eyes. A great full color antique scrap image of blue eyes with spectacles. This would work well as a mask for a creepy costume! 50) Boa Constrictor Skeleton. This fantastically detailed snake skeleton is a black and white etching. I just love how the boa constrictor’s body is curved and coiled, showing the great details of its very flexible spine. This snake would be great for Gothic style projects. 51) Eagle Talons. This etching is a closeup view of an eagle foot and talons. The scales and curved nails make it super-spooky. This image would work well for witch’s brew type projects. 52) Full Human and Ape Skeletons. This antique medical image compares the bones of a complete human skeleton with those of an ape. The images are in black and white and I’ve included the original sepia-toned scan as well for a vintage look. 53) Skull Image. 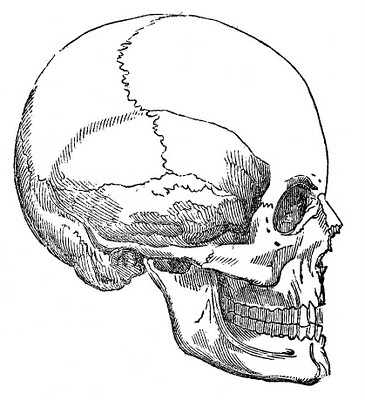 This one is a vintage anatomy skull image, scanned from an old anatomy book. The old engraving and has incredible detail, with all the original numbers in place, I think it adds an authentic touch to it! So perfect for your spooky Halloween Craft or DIY Projects! 54) Watchful Eye. This is a free public domain image of a watching eye! This black and white image shows an eye with eyebrow and rays radiating from it. It was scanned from an Antique Circa 1828 Printer’s book. I’m not sure if this eye symbol has a particular meaning behind it, but I thought it was really interesting looking. 55) Dissected Heart. This full diagram of a heart is from an old nurse’s book. The black and white etching shows a cross section of the heart with its cavities and major veins and arteries labeled. The pulmonary artery and aorta are colored in blue and red, and there are some red arrows to show the path of blood through the heart. 56) Skull and Crossbones. This is an early Halloween image of a skull and crossbones. This one was scanned from a Circa 1828 Antique Printer’s Book, and is a rather creepy looking image…just perfect to make poison labels with for Halloween! 57) Phrenology Head Diagram. This lovely old diagram came from an old reference book from the 1880’s. The piece shows a bald head facing right with different regions mapped out and labeled with different characteristics. 58) Halloween Owl and Witch Image. This old card image shows a pretty young witch woman in a red cape and blue hat. She has lovely curly dark hair, and an inquisitive owl is perched on her shoulder with a sliver of moon in the background. The card reads “Jolly Halloween”. 59) Adorable Pumpkin Witch. 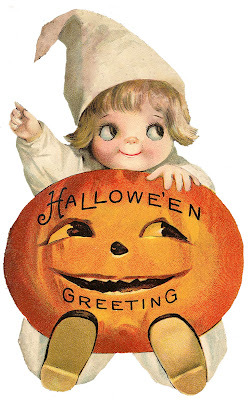 This cute vintage postcard shows a little pumpkin head girl, wearing a leaf outfit and a black witch hat. She is brewing something in her black cauldron, which a black cat watching from a tree branch above. This cute full-color drawn image comes from an old Halloween card. 60) Pumpkin Head Boy with Owl. This vintage Halloween postcard shows an adorable little pumpkin head boy with his pet owl cuddling on a branch in the moonlight. The clouds in the sky are dark and ominous, but the boy and owl seem to be buddies. The postcard has some additional words for a Halloween greeting on the front as well. 61) Pumpkin Man Driving Car. This funny little postcard has a Jack O’ Lantern with a driving hat on, driving an old fashioned car with two more pumpkins as headlights. The card says “You auto have a Happy Halloween”, and is a fun little graphic that would be great for cards and Halloween projects. 62) Witch Girl in Jack O’ Lantern. This vintage postcard shows a cute little witch girl with a green cape and pointy hat standing inside an oversize Jack O’ Lantern. She is brewing up something in her cauldron and holds a spoon for taste testing. A black cat and some bright red apples are at her feet. 63) Palmistry Hand. This super cool advertising card from a root beer company shows a left hand, palm up. The various letters on it denote special lines or areas of the palm to analyze. This piece of full color ephemera would make a perfect image in Halloween collages! 64) Gravestone Clip Art. This is an interesting old free vintage gravestone clip art image. The engraving was scanned from an 1889 marble company catalog. The blank headstone (perfect for adding your text!) has a two-stepped base, a rectangular shape with an arched top. 65) Owl on Smiling Pumpkin. This one is an adorable smiling pumpkin with an owl perched on top. The owl looks so adorable with his bright & wide eyes! The antique scrap is done in shades of orange and yellow. 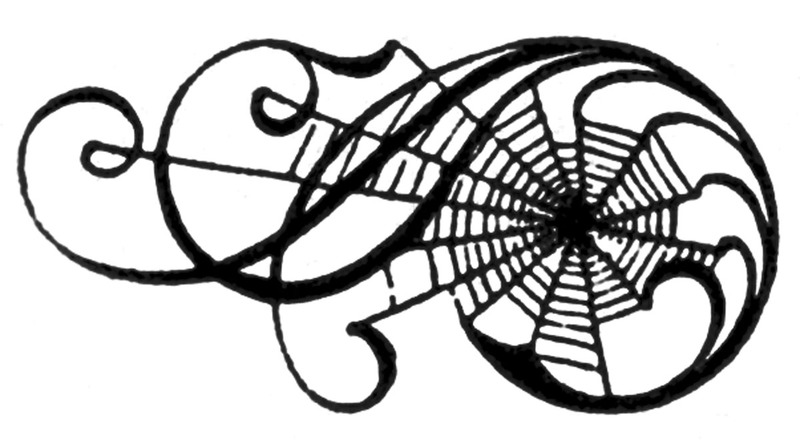 66) Spider Web. This black and white spider web image shows a primitive looking web built in between two branches. 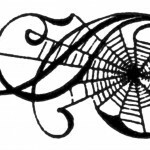 The very circular web would be great to use on labels, tags, cards or menus — just about any Halloween project you can think of. 67) Skull Apothecary Label. This spooky old label was for some type of medicine. The ad is black and orange with a creepy side view of a skull. I thought this one would be great to print out and use as a label for an old bottle in a Halloween display. 68) Cat Lady Costume. This fun black and white graphics comes from an 1880’s costume book in my collection. It shows a lady dressed in a cat costume with a cat head hat and a furry cape and dress. 69) Retro Lady with Pumpkin. 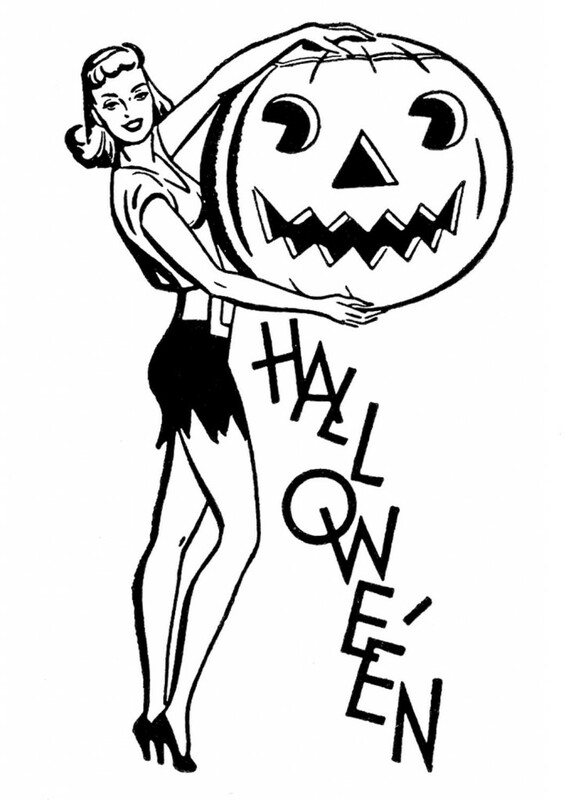 This fun black and white image looks to be from the 40’s or 50’s and shows a fun woman in high heels holding a huge carved pumpkin. She reminds me so much of a pinup. The word Halloween is written vertically on the right side. 70) Retro Costumed Ladies with Pumpkin. This cute retro Halloween image features two ladies in costumes. One wears a checkered dress and the other is dressed like a clown and holding a large Jack O ‘Lantern. This black and white retro image would be great to use as a Halloween party invite! 71) Retro Kids with Pumpkin Ghost. This fun retro Halloween graphic shows a young boy and girl with a Jack O’ Lantern on a stick with a sheet for a body. This fun retro graphic is in black and white, as well as a black and white version with just the pumpkin in orange. 72) Retro Bat Frame with Ghost. This one is an interesting Halloween graphic, that shows a frame made of bats touching wings, with a ghost inside of it. Fun! I’ve also including a version of the bat frame without the ghost, so that you can put whatever you like inside. 73) Vintage Snakes Etching. This vintage engraving was scanned from the newest addition to my collection – an 1838 German book about amphibians! 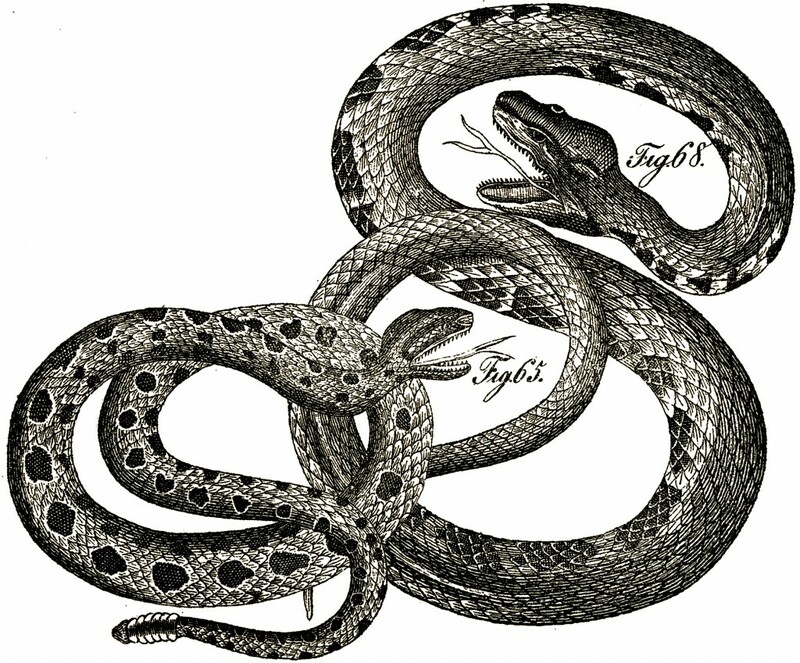 The creepy, but cool, black and white drawing shows two curly scaly snakes. They look quite menacing with their fangs and tongues showing. Included is a black and white version, as well as the original creamy paper version. 74) Creepy Bird Image. This vintage bird (possibly a vulture) circa 1878 is in the process of eating his prey, and looks to be pulling apart the animal with his beak….not for the faint at heart! The bird is mainly white, with tan wings with dark brown tips, and interesting yellow accent feathers on his face. 75) Earth Worm Image. This worm isn’t the most attractive, but the old image shows a full color worm in shades of pink and black with fine detail. He would be perfect for your scarier projects this fall. 76) Lizard Engraving. This scaly detailed lizard image came from an 1838 German book. The black an white drawing shows a lizard with a curled tail. I’ve included the original scan on cream paper, as well as a white background version. 77) Creepy Bat Skeletons. These super-creepy looking bat skeletons come from an early natural history book. One image is a bat skeleton diagram with outstretched wings, so you can view all of the bones in his wings. The second graphic shows a vampire bat skeleton in side view, in what looks to be a walking, or ready to fly, pose. 78) Leafless Trees. These trees have lost all of their leaves and are getting ready for winter. The dark lines give them a spooky look, perfect for Halloween projects. I’ve included two images, one with three trees and a second image with a single tree with tons of twisting branches. Well that rounds it up for now! We have close over 250 Halloween Images in all, with many more being added all the time! If you don’t see something here that you like, make sure you use the search bar on the top of this blog to search for even more. We hope you enjoyed this collection of Halloween Images and Halloween Clip Art. Happy Halloween! You might also like our Free Fall Collection of Images HERE. 12+ Free Vintage Mother’s Day Images! 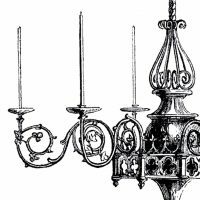 7 Chandelier Images – Free Clipart! Happy Halloween Cute Girl Holding Pumpkin Postcard! I’me going to try printing on burlap and some of these are perfect!! How can you print on burlap? I’m new to this and just love all these ideas! WOW. Thank u so much. Beautiful brown tone owl. Yay!! Thanks for sharing Susie, that’s so sweet of you! Karen, you are the best! These are awesome! Thank you for always being so generous, Karen! Thanks so much for sharing these. What would bloggers do without the Graphics Fairy… now that’s a spooky thought! Thanks everyone!! I’m so glad you are finding this post useful, Emily did a great job putting it all together for all of us! Thank you so much for this amazingly generous collection. Wonderful post. When I click on the link (21) Two Color Pumpkin.) I get sent to Retro Ladies-Day of Beauty. Thought you would like to know. You always have such great images. Thank you. Updated the link. Thanks Kim! Thank you so much for these. I am in England where we don’t go quite so “all out” for Halloween, but I caught it from an American Neighbour a few years ago and now have the most cobwebbed house in the County come October 31st. Love all these images but especially the natural history plates. Thanks so much. Will be fun decorating this Halloween! Thank you so much! Love these! I do have a question…I’m trying to print the skull side view, but I would like it to fit inside a 5×7. Do you know what I need to do to reduce the size? Thanks! You’re my go-to whenever I need some awesome prints. Thanks Megan! I checked out your project, it’s awesome!! I tried to leave a comment on your blog but it wouldn’t let me. Thanks for the shout out! I use your free downloads so often in my work and I’m so thankful to have you as a resource! hello Karen, I cant get the links to work to the individual pictures? Can you check them out for me? As usual, you’re amazing! Thanks again for always coming up with such fun images! These are definitely some of my favorites. 🙂 The ravens and bats never fail to make me happy. Thanks so much for these! they are wonderful. These are great, can you tell me where the bird in the title graphics is on the site please?